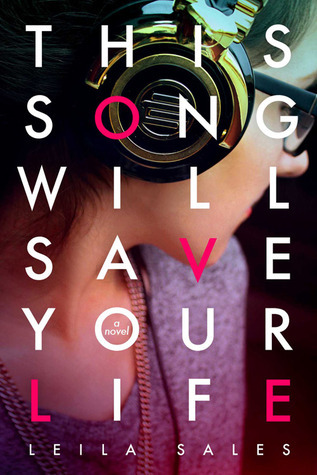 The good: I'm sitting here listening to the "These Songs Will Save Your Life" playlist on Spotify while I write this review and I'm somewhat at a loss. How do I begin to this describe how unexpectedly powerful this story was? Elise Dembowski has spent her whole life not fitting in and being tormented by her classmates and she just can't take it anymore. Then during one of her late night walks, she stumbles across a warehouse party where she finally meets people she clicks with and discovers a love for DJing. The author gives Elise such a unique, funny and sympathetic voice. She's not even "real" but I could feel myself getting increasingly worked up and upset when people were mean to her. I couldn't understand it! At the same time, there is no doubt in my mind that kids can be this cruel to each other. I've seen it myself (and not just with teenagers). Elise is very socially awkward which I found to be part of her charm. She's passionate and once she puts her mind to something, there's no stopping her. But even more so, she knows she's capable of accomplishing anything she sets out to do. She has this confidence in her intelligence but none whatsoever when she thinks of her lovability or personality. It's so sad but I think it's a feeling we've all had at one point or another. And watching her embrace DJing as a way to share her love of music and connect with people was gratifying to see. It was so easy to feel invested in her and to want her to find the love and acceptance she desperately craved (and deserved!). As the book goes on, we're introduced to many different characters and I enjoyed the balance between Elise's innermost thoughts about herself and then getting to see how those people actually viewed her. We see all facets of her life - her family, the girls at school she's not sure if she's really friends with, the new people she meets at the warehouse, fellow DJ Char. But my favorite part of the book (one of many really) was when the author would switch to second person. I know that might sound strange but every time she did, I felt like she was talking to me. Telling me to be brave, to accept myself and that I was enough. This Song Will Save Your Life isn't just Elise's story, it's also a beautiful message about self-worth and acceptance. Do I recommend? : A resounding yes. I didn't expect to get as immersed in this book as I did and I have no doubt you will too if you give it a shot. I want to read this so badly, so I'm happy it's out! Thanks for your thoughts, so glad you hear it was amazing for you! I keep seeing great reviews for this book. I love that you have no reservations, lol. Hmmm, switching back and forth to second person? I'm intrigued! Great review! Isn't this book such a pleasant surprise? I really enjoyed it too! I love how the music + Elise's DJ-ing is woven into the storyline, and how Elise felt like such a real character. Her story, although not to the same extreme, could have been mine at some points in my life, so I definitely could relate to that too. Glad you liked it!